Well, folks, we made it to February. Normally, I'd express disbelief that another month has passed, but my eyes are fully focused on the future and I want August to hurry up and get here already. Especially now that I received confirmation that my wedding dress is in! 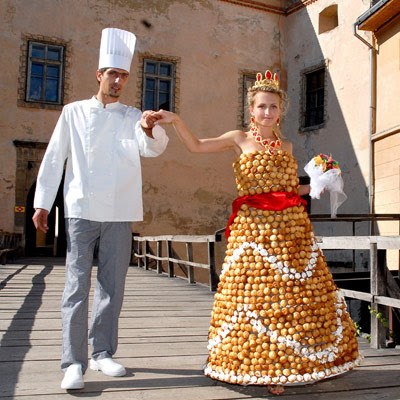 When Stephen and I first announced our engagement, several friends joked that I should have had a dress designed for me, one made entirely out of food. While I love food (obviously), I'm not adventurous enough to attempt something like that. Besides, with the summer heat, I wouldn't want to deal with worrying about my dress melting or wilting before I had a chance to walk down the aisle! But they got me thinking... Can I have my food and wear it, too? After discovering these adorable pieces of jewelry featuring food-related items of all kinds on ModCloth (one of my favorite fashion websites), I've decided that the answer is YES! Check out these sets I created on Polyvore of the necklaces, rings, and other things. You might even find a cute little Valentine's Day gift for your favorite foodie! Do you use Polyvore? Let me know... I'd love to see what kinds of sets you guys are creating!